On March 21, Hengtong obtained the GREENSTAR certificate issued by the Bureau Veritas Australia Pty Ltd because of its good and sustainable performance in environment protection. GREENSTAR certification is a kind of evaluation system to evaluate the impact of various buildings on the surrounding ecological environment. S. K. Merz first developed it on the basis of BREEAM, LEED, and then Australian Green Building Council optimized it and obtained the ownership of the evaluation system. GREENSTAR is an important part of the evaluation system of Australian green building. Its certification is mainly used to evaluate the existing building environment and to certify which the star standard it reaches. The certification covers power cables, communications cables, optical cables and their hybrid products containing PVC materials. 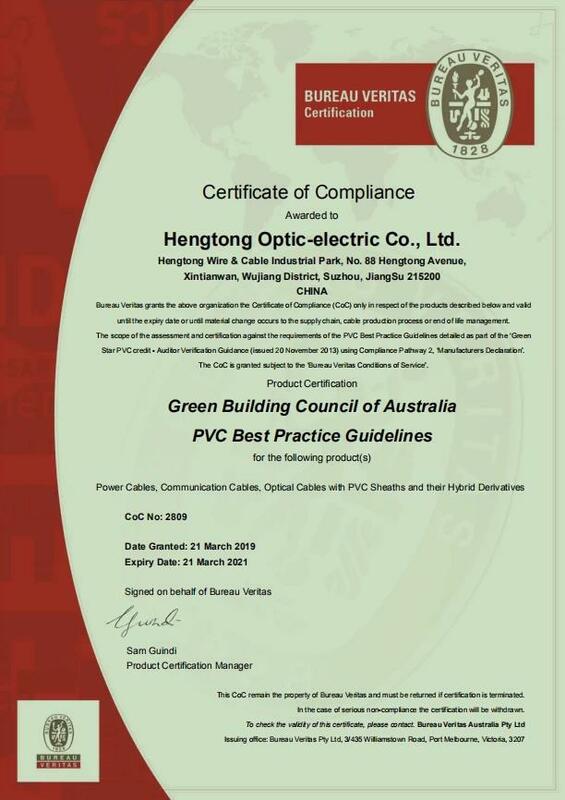 In order to meet the mandatory requirements of high-end green environment protection in Australia, Hengtong’s technical and purchasing department established a comprehensive guarantee plan to strictly select raw materials suppliers and comprehensively evaluate its relevant supply chain companies, as to ensure the acquisition of the certification in the planning time.